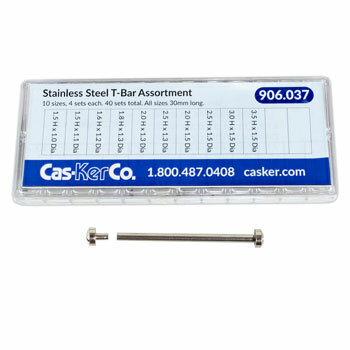 Stainless steel T-Bar assortment contains 4 sets of 10 different large sizes. All T-Bars are 30mm or 36mm long. 40 pieces total. T-Bar Pins for metal watch bracelet links. Large sizes. Size is head diameter x tube diameter x tube length. These Cas-Ker Watch Parts are in stock and ready to ship to you! Most watch parts orders ship Monday through Friday within 24 hours of the time your order is received.